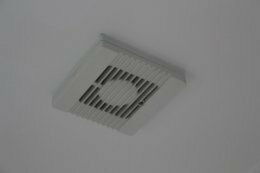 What do I mean by whole house ventilation and how does it differ from the typical forms of ventilation found in houses throughout the UK and Ireland? Surely the traditional forms of ventilation such as extractor fans and the like are perfectly adequate? And aren’t these new dedicated ventilation systems difficult to install and expensive to run? Before we proceed, it’s important to understand cross flow ventilation. 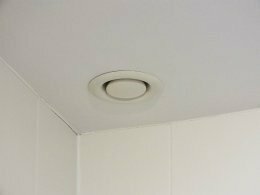 This is where you provide ventilation to several parts of a room or property in order to maximise the airflow across that room or property. So, if your were to have a single point of ventilation as in the top left diagram below the air would get in ok but the stale air trying to get out would have to fight against the incoming air, restricting the amount of ventilation possible. If you were to add a second opening the air could get in through one opening and out through the other one (creating cross ventilation). The more ventilation points you create the more of the air within the room gets moved. If you look at the diagram with two openings the centre of the room is constantly being ventilated but the air at each end and in the corners isn’t moving much. But if you have several openings or ventilation points the entire room can be ventilated. Whole house ventilation simply expands the idea of cross ventilation and applies it to the entire house. So not only are you trying to create cross ventilation in individual room but you’re trying to create cross flow ventilation around the entire house. It sounds straight forward, but it’s very difficult to achieve properly without a custom installed MVHR (mechanical ventilation and heat recovery system). The reason it’s difficult to achieve with say a positive pressure ventilation system is because with a positive pressure system the fan unit is located in the hallway or landing (as this area typically has direct access to all the habitable rooms). However if a door is closed to say a bedroom you’ve immediately reduced the amount of ventilation to that room as you’ve restricted air flow to what will go under the closed door. Compare this to a MVHR system which is ducted to each room so that open or closed doors have less of an effect on the level of ventilation and you’ll see what I mean. 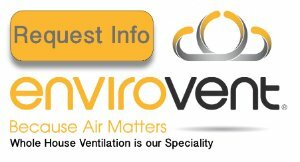 If you look into the MVHR system a little more you’ll notice the “dry” rooms (rooms that don't generate moisture) such as the living room and bedrooms have fresh air pumped in. 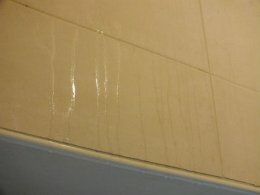 Whereas the “wet” rooms (room which do generate moisture) have stale air sucked out. This has the effect of creating a cycle of air throughout the entire house. In other words wet rooms create negative pressure and dry rooms create positive pressure and as we know, air moves from areas of positive pressure to areas of negative pressure. 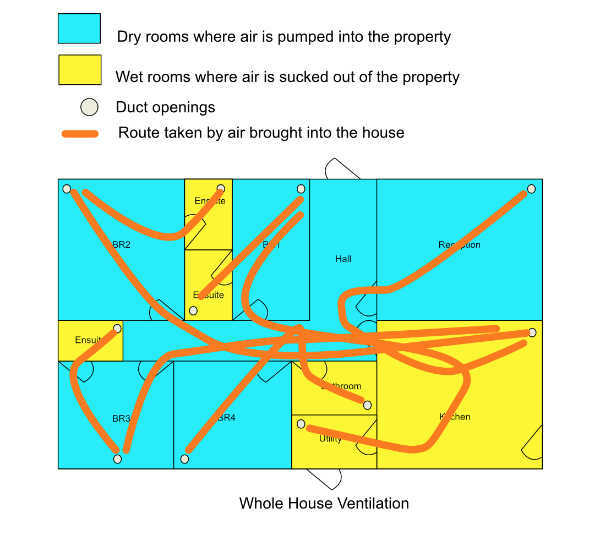 The location of the ducts in a MVHR system is very important as placing them as far away from the door in a room as feasible means more of the air in that roomful get moved before it escapes out the door on its way to a wet room. If the duct was located inside the door of the room the air going into the dry room would immediately go out the door towards the wet room without moving any of the remaining air in that room. How do traditional ventilation methods stack up? Bathroom and kitchen extractor fans - these tend to extract air from a single room and while there will be a knock on effect on other immediately adjacent areas by way of air coming into the room around the doorway or via open windows the cross flow ventilation effect is minimal as off-the-shelf extractor fans tend to be fairly underpowered. 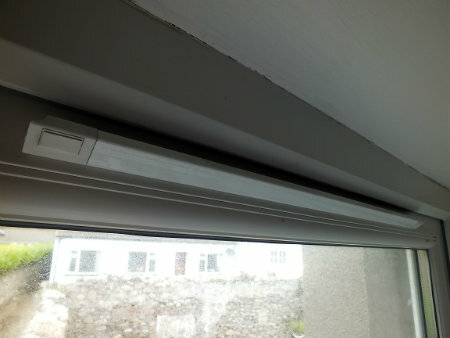 Trickle vents in windows - these do allow ventilation to all the rooms that have vents fitted (provided you open them). 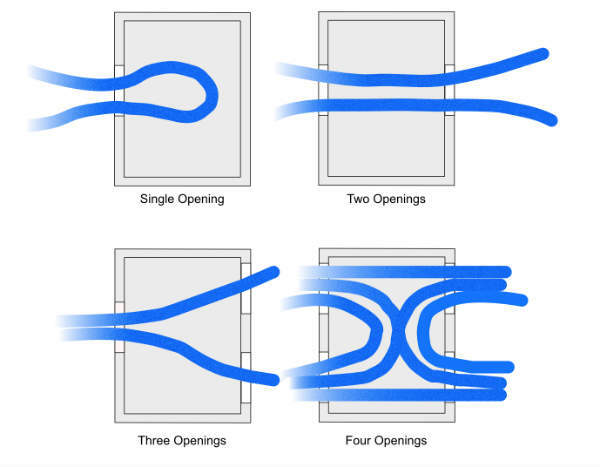 The more windows with open trickle vents in a room, the better the cross flow ventilation, as per the diagram above. However, as there is no mechanical fan pushing or pulling the air they rely on the wind to create air pressure changes to either push in or pull out the air. So How do we Achieve Whole House Ventilation? The answer will depend on the type of property you have and whether or not you’re building from scratch or not. When building new it’s easy to incorporate a dedicated MVHR system (mechanical ventilation with heat recovery) which offers the best solution to whole house ventilation. So I’ll not spend a lot of time going into that. 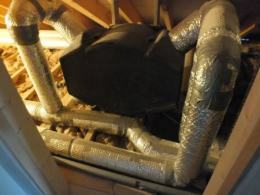 But do get an expert to design and fit the system and make sure they use high quality filters and correctly sized ducts. Two or more storeys - installing MVHR will be more difficult as you’ll have to get all the ducts to the ceilings on the ground floor without cutting out rafters etc. which would structurally weaken the first floor. If you may find that achieving whole house ventilation by retrofitting a MVHR system is too expensive due to the construction of your house there are still options. Like me, you’ll probably have to compromise and accept that you’ll not get an automated whole house system. 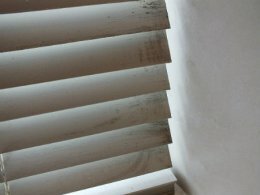 You can still improve on your existing ventilation by giving a little thought to installing more modern and higher quality ventilation systems such as humidity sensing extractor fans in the bathrooms, or positive pressure ventilation and get into the habit of opening and closing trickle vents and windows when required. Either way, if you’re currently suffering from condensation and/or black mould issues there are solutions out there. It’s just a matter of deciding which one will achieve what you want, within your budget. Home Page. › Home Ventilation Systems. › Whole House Ventilation.